Hike the trail to Ruffey Lake and Meeks Meadow Lake for a day, or backpack in and camp overnight. Ruffey Lake and Meeks Meadow Lake lie just below Etna Mountain in Klamath National Forest, just north of the Russian Wilderness. Both are sweet little lakes, both quite different, and both with their own charm. These are two of my favorite out-of-the-way lakes near the Russian Wilderness; do this hike and you may not see anybody else, even at the height of the summer hiking season. When it’s time for a new edition of my Day Hiking: Mount Shasta, Lassen & Trinity Alps Regions, this hike will definitely be included. Drive CA Highway 3 to the Etna turnoff, which is 26.5 miles from the junction of CA Highway 3 and I-5 in Yreka and 12.7 miles from Callahan. Drive a half mile down Collier Way, turn right on Main Street, and then drive 10.5 curvy and paved miles on Sawyer’s Bar Road to Etna Summit (actually a saddle). Park in the large lot on the left. Find the Pacific Crest Trail in the back part of the parking area near a signboard. Go right and start a moderate climb south. The Etna Creek drainage that hold Sawyer’s Bar Road is down to the left. Views are magnificent, including the Scott Valley, Etna Mountain, and the heart of the granitic Russian Wilderness just a few miles away. 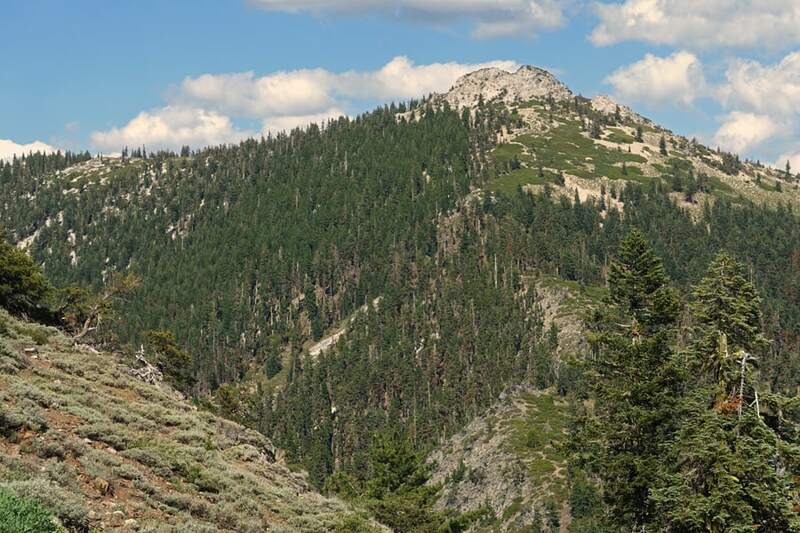 The route alternates between open slopes filled with summer wildflowers and the deep shade of Shasta red fir forest. Make sure you look behind you at the northerly vista of the Marble Mountains. 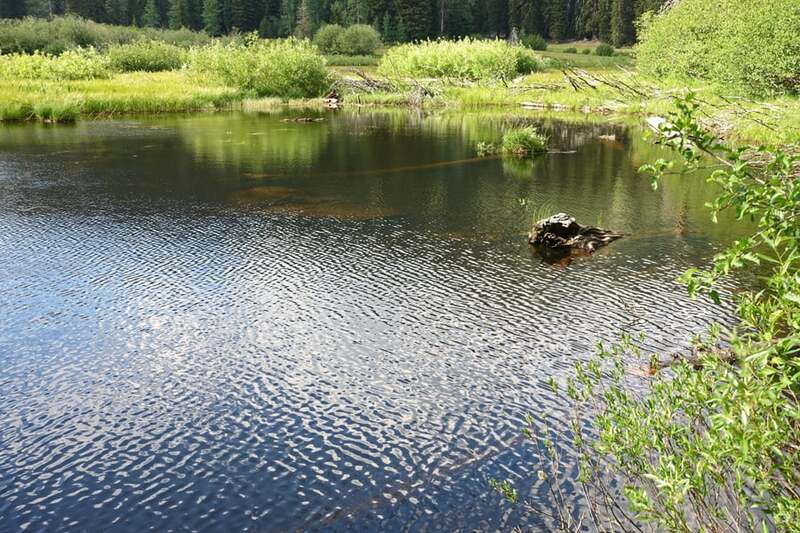 Reach a fork with the Ruffey Lake Trail at 1.6 miles. Head steeply uphill just 200 feet to a gap dominated by the visage of Etna Mountain. From here the Ruffey Lake Trail descends a series of switchbacks east through Shasta red fir forest to reach Ruffey Lake at 1.9 miles. Thick forest borders the lake on three sides, with a broad rock ledge on the north side where the glacier that carved the lake spilled downhill toward the lower Ruffey Lake. You’ll find a couple of places to camp near the west shore, and a level place or two on the rock ledge. Make sure you follow Leave No Trace principles because you’re very close to the water. If you have a fire, you must also have a campfire permit. Anglers can fish for eastern brook trout. This Etna Mountain is in Klamath National Forest and Siskiyou County in California; don’t confuse it with Mount Etna in Sicily. Our Etna Mountain is granitic and geologically stable, whereas Mount Etna in Sicily is an active volcano. I haven’t yet climbed Etna Mountain, but it’s definitely on my radar. I did talk with a guy who climbed it, plus I’ve eyeballed it many times. The best route starts from the northeast cornet of Ruffey Lake. From here, make your way up and northeast, initially staying just to the right of the steep area. Stay near the ridge. Sometimes you’ll climb in the open, sometimes in forest, and sometimes you’ll have to plow through brush. The final bit to the top involves some scrambling and is likely easier from the north side. You’ll have a 360-degree view of the Marble Mountains, the Scott Valley, the Cascades with Mount Shasta, plus the Eddy Range, the Russian Wilderness, and the Trinity Alps. From Ruffey Lake the trail heads easterly and descends slightly through open territory dotted with summer wildflowers. It then begins a southerly descent through forest, eventually bordering an attractive meadow before arriving in the Meeks Meadow Lake Basin. 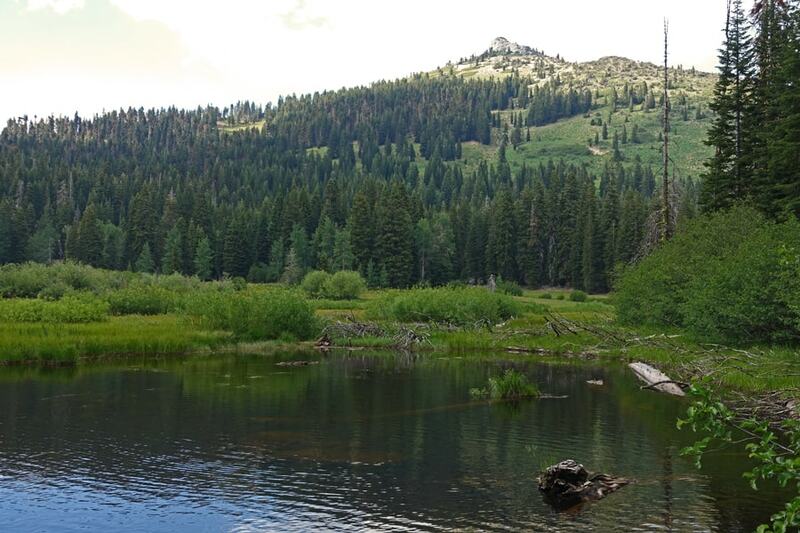 It’s lush green here, from the willows and alders in the meadow to the shimmering leaves of quaking aspen to the needles of the many pine and fir trees. Reach a trail fork at 3.1 miles. A left quickly reaches a meadow with camping opportunities. The main trail goes right past more level places to pitch a tent to cross Meeks Meadow Creek right at the lake’s outlet. Cross to the far side and look for a rough path that goes west 200 yards to the south side of the lake. Here you can gaze at the shallow waters and the headwall on the west side, and take in the visage of Mount Etna. Shallow Meeks Meadow Lake is nearly surrounded by willows, alder, and meadows. 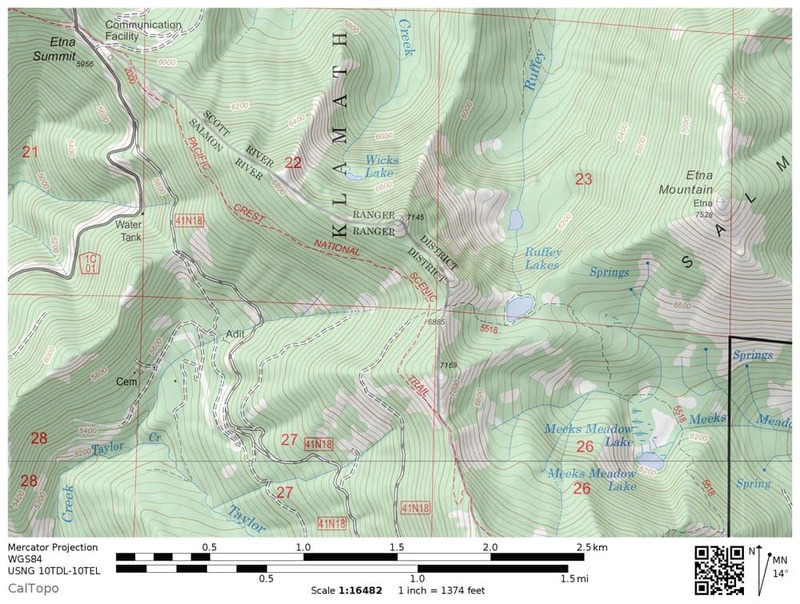 The US Forest Service map of the Russian Wilderness shows a trail junction a few hundred yards south of Smith Lake. 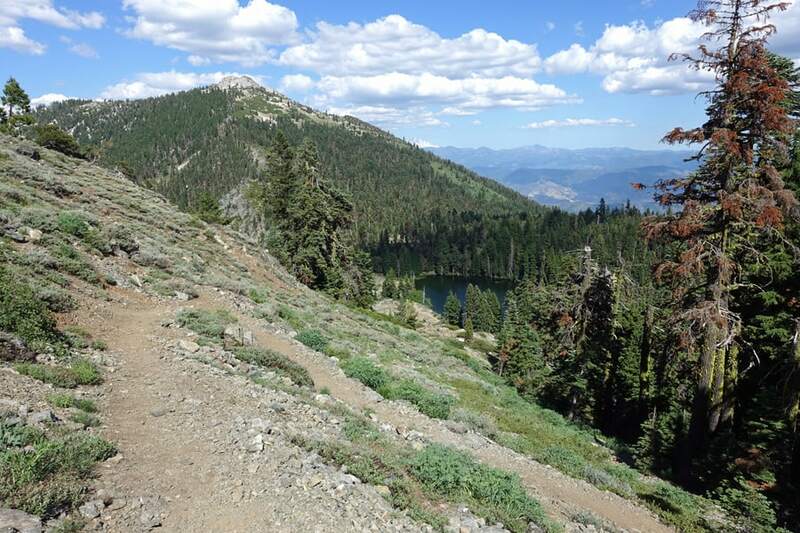 A trail leaves the Pacific Crest Trail and — on the map — initially runs northeast before swinging south and then north to arrive at Meeks Meadow Lake. I started on this trail on July 5, 2018. It was initially easy to follow, but quickly become covered with needles and duff. Either I lost it or it became very faint. I eventually decided to strike northeast cross-country down the granite talus jumble below Smith Lake. I recovered the trail about a half-mile from Meeks Meadow Lake and switchbacked my way to Meeks Meadow Lake on obvious trail. 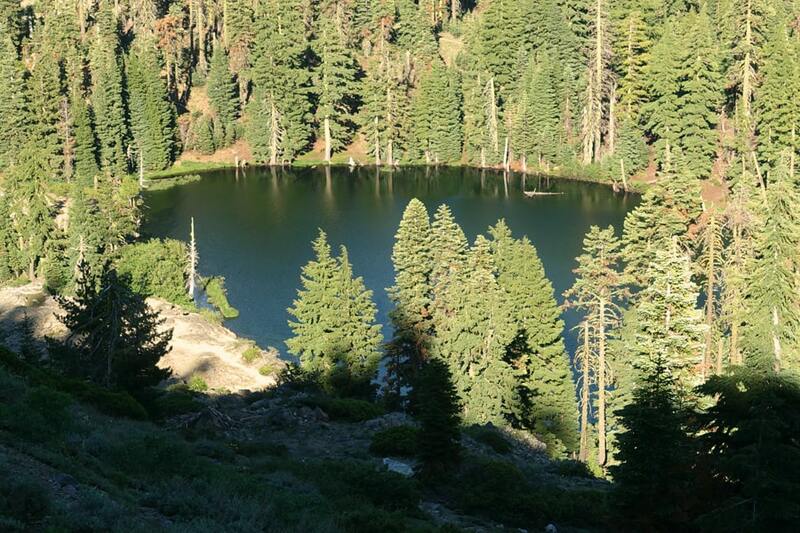 Have you been to Ruffey Lake or Meeks Meadow Lake? Thoughts? Questions?